My obsession with pancakes is well known among my family and friends. Ask me what I want for breakfast on any given day and PANCAKES! is the first thing that pops into my mind. There are even days when whipping up a batch of pancakes sounds like the perfect gourmet dinner menu. Of course my pancakes are not your average lightly browned breakfast cake. Instead, they are filled with gobs of goodies both healthy and unhealthy, to round out whatever mood I’m in. There was an old waffle recipe I found online 10-12 years ago. I’ve adjusted added to this and made it more my own. Now, I share and encourage you to explore and create your own perfect pancakes. It helps to get out all of the ingredients and have everything within arms reach as you begin. Turn on your griddle or flat pan to medium heat and allow your cooking surface to get hot while you are preparing the pancake batter. Fill a large measuring cup with water and set aside for a few minutes. Combine the dry ingredients together in a large bowl. Stir with a fork to distribute everything evenly. Create a nice hole in the middle of your dry ingredients. Next, melt the earth balance (margarine) in a small cup or prep bowl in a microwave for about 15-30 seconds. Add the vanilla to the earth balance bowl. Add the margarine/vanilla mixture into the center of your dry ingredients. Begin stirring slowly, and then immediately begin adding water into the mixture. Slowly mix, from the center so you are getting out lumps as you go. Don’t let the batter get really thick and goopy, keep enough water so that it is the consistency of a thick brownie batter. Add more water until the dry ingredients are mixed in well. You may not need all of your water, so do not just dump it all in. You don’t want your batter super thin, it should be just a little thicker than an average cake batter. If you are new to making pancakes, read the instructions below for preparing your cooking surface and knowing when to flip. Making pancakes is as easy as child’s play. This past summer I taught my 11 year old nephew how to make pancakes, flipping them at just the right moment. He thoroughly enjoyed himself. The key to making pancakes without creating a gigantic mess is perfecting the heat of your griddle, and then timing the flip just right. Heat: Turn on your burner to medium heat. Choose a large non-stick skillet with a flat bottom. If you have a griddle that covers more than one burner – even better! Allow the burner to heat up for a few minutes. Test your cooking surface by pouring a teaspoon of batter into the middle. Within a few moments, you should see little bubbles appear all over the surface of the mini cake and the edges will harden. If it takes more than a few seconds for this process, then your griddle is not hot enough. Following the instructions at the beginning, if you turned your stove on before making your batter and your cooking surface is not hot enough yet, you may need to turn it up just a touch. Not a lot, just one notch. Too much heat and you burn your pancakes! Wait a minute for the extra heat to distribute and try your test cake again. When you have a surface of bubbles and the edges have stopped moving, swiftly slide your large flat spatula beneath the pancake and flip! A swift movement helps to make sure that the batter does not run off the sides and create a mess. Allow the other side to cook for a few moments. If your first side was not brown enough, go ahead and flip back over and give it a bit more time. Serve immediately with your favorite garnishments! 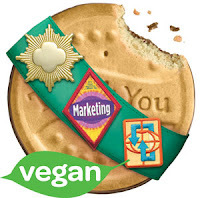 Thin Mints are now Vegan! No, this is not a dream. Yes, I know you are smiling recalling the pre-vegan days of doing just this. 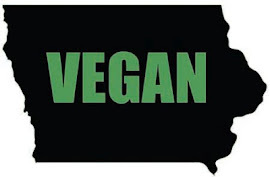 If you live in Iowa and are buying Girl Scout cookies from an Iowa Girl Scout, not only do you have vegan choices, but you are also purchasing an Iowa made product. As a bonus, you are helping a girl reach goals while gaining courage, confidence and character. What could be better? Of course, having spent most of my professional career working for Girl Scouts here in Iowa, I have known which cookies are vegan friendly for years. However, ABC Bakers located in Sioux City, Iowa has finally decided to market this little known fact right on the cookie order form. Peanut Butter Patties, Thanks A-Lots, Thin Mints and Lemonades are all vegan! ABC has gone one step further and changed the chocolate used in Thin Mints, making these best selling cookies even more accessible to people with food allergies! Last year there were only 3 vegan cookies, this year there are four. After all, that is what girls asked for. And, in an organization dedicated to girls, a girls voice goes a long way. 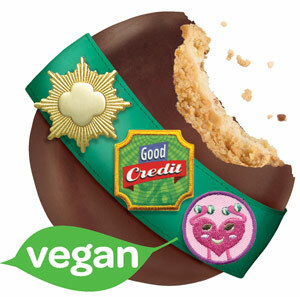 Following the Girl Scout cookie sale last year, a troop of girls wrote into the office and asked the cookie company to make Girl Scout cookies more accessible for people with food allergies. A co-worker and I cheered on the the girls who sent the letter and forwarded on the girls' request directly to ABC. There is also a little bit of differentiation and competitive marketing happening here as well. You see, there are two bakeries nationwide producing those delectable chocolate covered pieces of heaven. 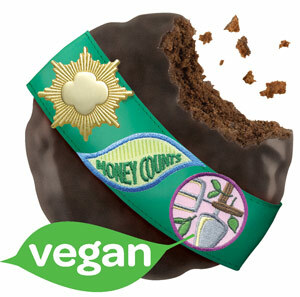 (Did you know that Thin Mints are the #2 best selling cookie in the nation right behind Oreos? AND they are only sold for a month or two each year in each region of the country!!!) They are also competing for the business of the 110 Girl Scout councils, and looking for ways to make a stronger business proposal. Little Brownie Bakers, a subsidiary of Keebler, has ZERO vegan cookies on their cookie list. Zero. How do you know if you are buying the vegan version of cookies? Well if a Girl Scout comes to your doorstep with Tagalongs or Samoas, then your Girl Scout council does not have the vegan friendly Girl Scout cookie company. ABC Bakers has slightly different names for the five primary Girl Scout cookies that are sold by both bakers. They also have slightly different recipes for those same cookies. Obviously, ABC Bakery has the right idea. The Iowa Girl Scout councils also have the right idea by buying directly from an Iowa based business. It is the best of both worlds. So when those girls come knocking at your door order away! 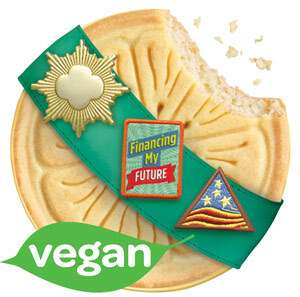 But first, remember that the Girl Scout cookie program is first and foremost a program. Girls are gaining skills like goal setting, decision-making, money management, people skills and business ethics. Ask that Girl Scout what her cookie goal is and how far along she is towards that goal. Did you know that 80% of women business owners were Girl Scouts? This isn’t just a national statistic. Girl Scout staff spoke at a Des Moines Chamber event last year and mentioned this statistic. A curious chamber staff person called every woman business owner on the Chamber list, and sure enough, 90% of the local women business owners were Girl Scouts! The number one leadership development organization in the nation has a strong 100 year history of breaking down barriers and helping girls grow to successful women.